Pay no attention to the lady behind the curtain grating zucchini! 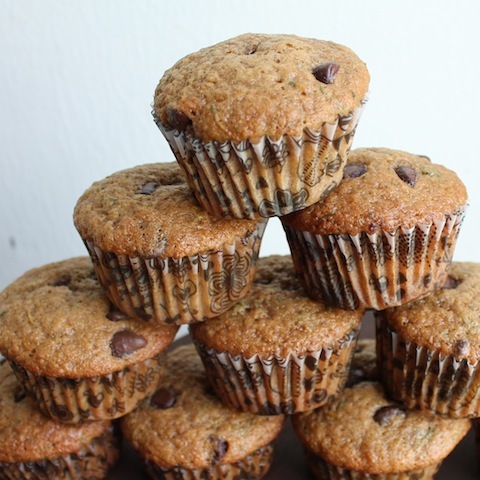 She is most definitely not putting it in these delicious chocolate chip muffins. Okay, I get it. Children, for the most part, don’t like zucchini. I didn’t either, way back when. But the truth is, if you grate the stuff small enough and don’t divulge that it has been added, the muffins get eaten relatively quickly and with great enjoyment. 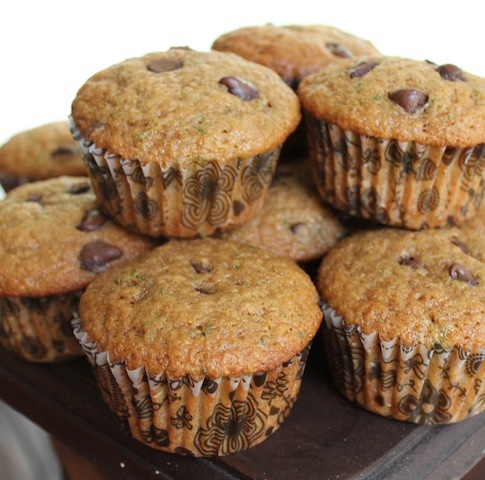 As you are probably guessing, this week’s Muffin Monday ingredient is zucchini, which lends itself to both savory and sweet batters. Since I was bringing this up to Lake Livingston to share with my sister and her family of three hungry boys, I decided to go sweet and just not mention the zucchini at all. Worked like a charm! 1/2 cup or 100g semi-sweet chocolate chips plus another handful to poke on top as camouflage before baking, if desired. Grate your zucchini with the small holes of your grater and spread it around in a colander to drain. Sprinkle with the 1/2 teaspoon of salt. In a large mixing bowl, combine your flour, sugars, cinnamon and baking powder. In another smaller bowl, whisk together your eggs, milk, vanilla and oil. Use the back of a spoon or rubber spatula to squeeze moisture out of the grated zucchini. Add it to the wet ingredient bowl and whisk. Add a few more chocolate chips to the top, if desired. 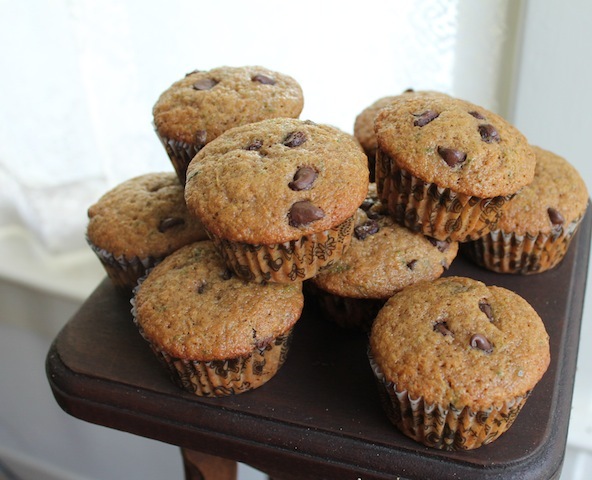 Remember, we are trying to sell these as just chocolate chip muffins. Bake for about 20 minutes or until the muffins are golden and a toothpick comes out clean when inserted in the middle. Remove the muffins from the pan and cool further on a wire rack. A side note to Communicating Across Boundaries readers: Welcome, welcome! I was thrilled when Marilyn asked if she could share my Muffin Monday posts with you all. You can find her blog in my Favorites list (up there in the left column) because, as you know, she is a rare gem and a gifted writer. I am honored by her link. Love this. I have a great chocolate cake with zucchini in it but haven't tried this. Thank you. Zucchini is great in lots of baked goods, Marilyn. I guess because it doesn't have a strong flavor and lends moisture. Thanks again for adding my link to your August Birthdays post! I was going to skip over this recipe (since I'm doing penance for all of those meals out while in the US on home leave) but I caught the 'zucchini' part and will definitely be making these for #2, whose teenage diet can always use some improvement. I have about a week before I go back to work myself, so I think a few batches of these tossed in the freezer might be perfect! I'm always sneaking veggies into baking - beetroot & chocolate muffins, pumpkin & ginger muffins. I just made an avocado & chocolate puree and no one could pick it it just tasted like chocolate spread. You're right they just add moisture and no one is the wiser and you can be quite smug! I love using pumpkin and applesauce in baked goods, Nancy, but I must confess, as much as I love them, I've never used beets, as the rest of the family are opposed. I am intrigued by you avocado and chocolate puree. Have you posted that yet? Must go have a look.